The French automobile supplier Bontaz has developed from a small automat turning shop into a first tier supplier. The company uses various Tornos lathes. The history of the Bontaz Centre is closely linked to that of the company’s founder Yves Bontaz, a man of impressive character who has made his mark on the enterprise: Innovative, dynamic and future-oriented. Yves Bontaz, born in Cluses in France in 1938, has been interested in mechanics and in the art of watchmaking since childhood. As a born entrepreneur, he and his twin brother resolved to attend the famous watchmaking school in Cluses. After this training Yves Bontaz worked for various small companies, most of which belonged to his uncles. In 1958 Yves and Florent Bontaz were called up for military service. After 30 months of military service, Yves knew that he had to become independent. With help from his parents, he bought his first machine. To finance it, his parents had to sell their horse. He acquired his first customers and was soon obliged to expand his machine park from 5 to 30 machines. For 10 years he undertook paid labor for large enterprises. In doing so he focused on productivity and quality. 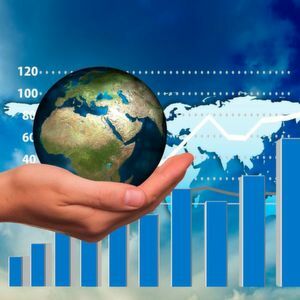 These two factors are still firmly anchored in the Bontaz Group. After 10 years of fulfilling orders, Yves Bontaz decided to climb the next step of entrepreneurship by buying his first three multi-spindle lathes and expanding the factory. Bontaz became a supplier to Peugeot and Renault, two of the biggest French automobile brands. One day, a buyer working for a major car manufacturer showed him a part that no other machine turning shop wanted to produce. It was an aluminum cooling nozzle, a central component of the motor cooling system. This part marked the beginning of continuous growth at Bontaz. In view of the pressure of prices from customers, Bontaz opened its first branch in Eastern Europe. Being bold, Yves Bontaz did not shirk from opening a branch in Shanghai soon after. And his boldness paid off. In China today, 400,000 new cars roll off the production line every month. They contain a part completely manufactured by Bontaz. After China, Bontaz tackled the American market, opening branches first in South and then North America. Today the Bontaz Centre Company employs 4,000 people and operates branches in 9 countries. As part of the desired continuous growth, a new production and assembly plant, 50,000 square meters in size, has just been opened in Portugal. Bontaz is no longer satisfied with producing only parts. In the meantime the company has grown into a first-tier supplier who is assuming a key role in the automobile industry’s value added chain. Apart from the cooling nozzle mentioned earlier, Bontaz has specialized in assembling various sub-components such as electromagnetic handbrakes and all possible fluid regulation systems. In Bontaz’s workshops one sees a number of cam-controlled Tornos multi-spindle lathes, all of them perfectly maintained. 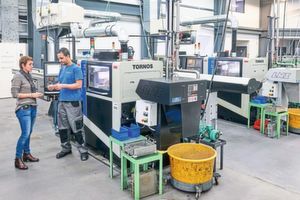 Only recently several Tornos machines of various types, such as the Swiss DT 13, have been installed in the workshops. This is thanks to the intensive efforts of Tornos Technologies France, with Bontaz as partner. With these five 5-axle machines, Bontaz has an impressive production capacity. «We chose the Swiss DT 13 for its attractive price, productivity and quality», says Yannick Bontaz, nephew of Yves Bontaz. 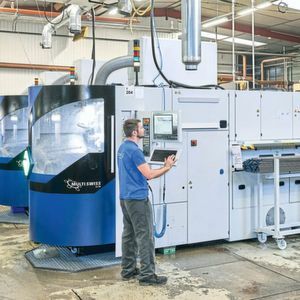 The Swiss DT 13 machines are a genuine alternative to the cam-controlled lathes because in addition to their huge productivity, they offer the flexibility of digital control. Thanks to their L-shaped kinematics, they can attain extremely favorable cycle periods. «Only recently have we acquired two Swiss GT 32 with B-axis. With these we want to produce highly-complex parts, and we have already been pleasantly surprised by the machine. Their high torsion resistance that extends to the B-axle, high performance and the tools, capable of being driven at speeds of up to 9000 min–1, make sure that with the Swiss GT 32 we can tackle highly complex cutting tasks. In addition, the machine’s price-performance ratio is really excellent», explains Yannick Bontaz. Bontaz has four Multiswiss 6x16 machines. «Although with Tornos we have had many years of good experience with cam-controlled multi-spindle machines, we have nevertheless approached a different supplier to buy NC-controlled multi-spindle machines», Bontaz confesses. He adds: «In fact, we were always very satisfied with these machines. But eventually we became convinced how efficient the Multiswiss machines are. At first we discussed the ergonomic advantages of this machine which conformed exactly to our requirements. But in the end, the technology behind the machines and their technical finesse convinced us. 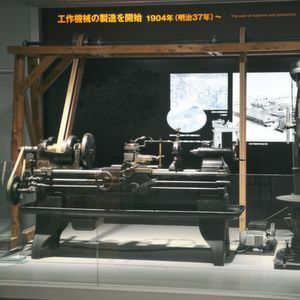 So we resolved to quit the well-worn paths and buy our first NC-controlled multi-spindle lathe manufactured by Tornos. The machine is easy to operate and set up; its set-up times are unusually short, which brings us enormous advantages. With Multiswiss, we react incredibly fast. The quality of the manufactured individual parts and series is excellent. So it is no surprise that we now have four machines of this type and have already ordered a fifth one». 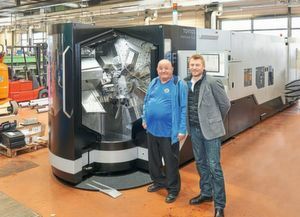 «In view of the success of the Multiswiss 6x16, we did not hesitate long when Tornos showed us the design for the small machine’s big sister: the Multiswiss 8x26. We decided to buy this machine quite fast. And I have to admit, it has already fulfilled its promises. It is well designed and, just like its little sister, has excellent features such as an incomparable dimensional accuracy, excellent thermal stability and a first-class finish. The success of our enterprise is based on the know-how of Tornos and its sophisticated machines, so we are happy to get the two new machines that will complement our Multiswiss-8x26 machine park», says Bontaz. The entrepreneur from Savoy, a dazzling personality, draws the following conclusion: «Just like for us, work that is well done means a lot to Tornos».